Welcome to another week, friends! How was everybody’s Thanksgiving? Filled with family, food, and friends, I hope. Like I mentioned last week, I had an extended visit at the in-laws and, boy, did we pack a lot in! All four siblings were home, so we made it into a Thanksmas holiday. We had your typical (yet delicious) Thanksgiving dinner on Thursday and followed it with the traditional Hoerr family Christmas on Friday, which always includes a candlelit fondue dinner and the opening of presents (the kiddos barely made it through the day with their eager anticipation). To cap off the night, in keeping with the fondue theme, there’s always chocolate fondue for dessert and we all sat around the fire, sharing highlights from the current year and how we can be praying for each other in the upcoming year. Aaannnd (as if that weren’t enough celebrations for one weekend), to top it all off, we had an early celebration for yours truly’s birthday with pizza and cupcakes on Saturday — nice and simple after a couple days of extravagant eating. I don’t know about you, but after the holidays where food is everywhere — as much as I love the food — it feels so nice to get back to a normal week of eating and routine. My body definitely appreciates it. One way that helps me stay on track and continuously form a routine with meals is forming a meal plan every week. Seriously, guys. This works. Meal planning/not having time to make meals/not knowing what to make at night/resorting to fast food is one of the biggest concerns I get from clients. Sound familiar? Believe me, you’re not alone. And if you’re already doing some form of meal planning, give yourself a pat on the back because you’re one step ahead of most people! You’re prepared. You’re ready for the week and you have one less thing to stress about during the week. You’re less likely to go out because you have things lined up. It’s totally okay to plan a night to go out to eat, but it’s best not to make it a regular occurrence during the week. Plus, it makes going out that much more fun and special. Philip and I rarely go out, but when we do, it’s extra special. Even going to Chipotle becomes a big deal. It’s budget-friendly. It’s a guarantee you’re going to spend more if you’re constantly going out to eat or buying food with no plan on how or when you’re going to use it. How many times have you gotten a bag of lettuce, expecting to “eat more salads” and then you find it, unopened, two weeks later? The average American wastes 14% of food purchases or $500 per year. Yikes! It saves you trips to the grocery store. With no meal plan for the week, you’re more likely to need to stop in multiple times a week to pick up a few things for tonight’s dinner. Shoppers who make “quick trips” to the grocery store spend an average of 54% more than they planned. Every minute you’re in the store, you average $2 in spending. I haven’t actually tested this, but just doing the math now, it seems about right. You’re planning for family meals when you meal plan. It may be cheesy, but a family who eats together, stays together. 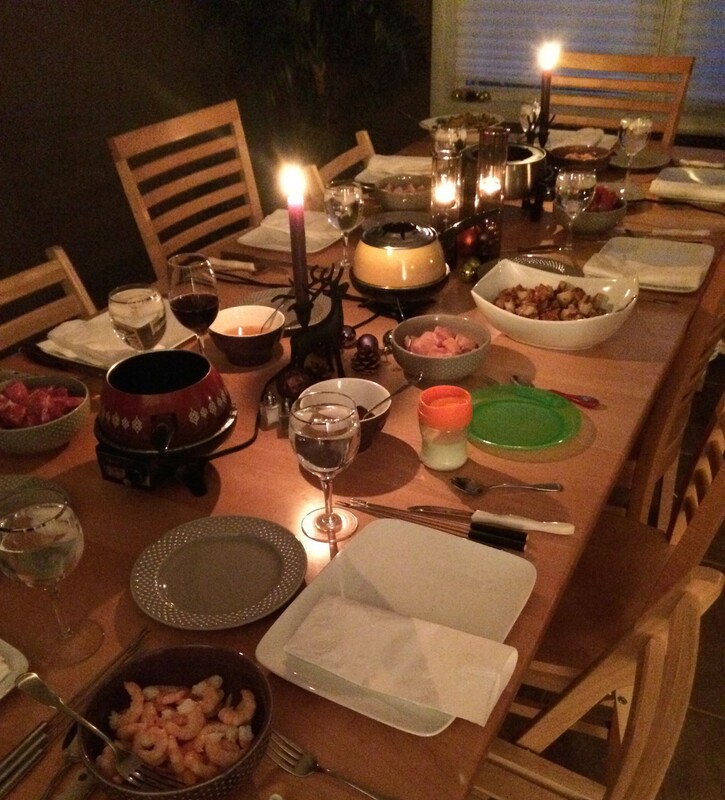 Along with meal planning, eating together as a family is something near and dear to my heart. 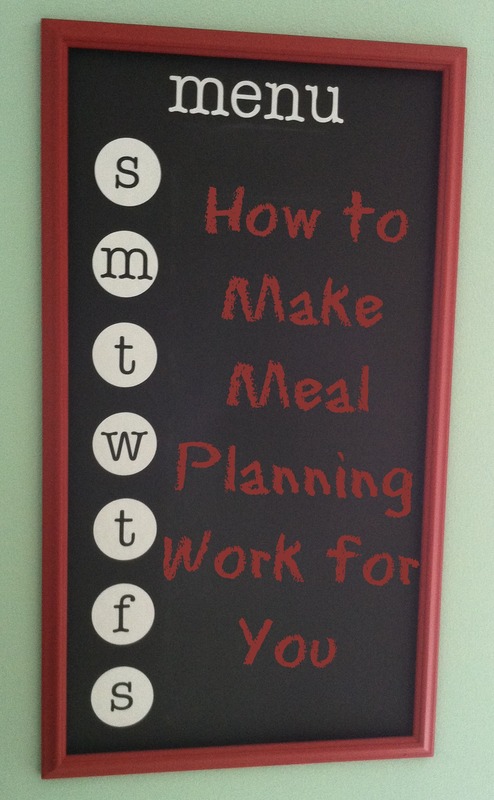 By making meal planning a priority, you’re prioritizing your family, too. Now, doesn’t that just make you want to jump right in and plan out your week’s menu right now? Before you get started, just remember to stick with it. It may seem to take more time up front, but you’ll be saving yourself time and stress later in the week by already having meals lined up. 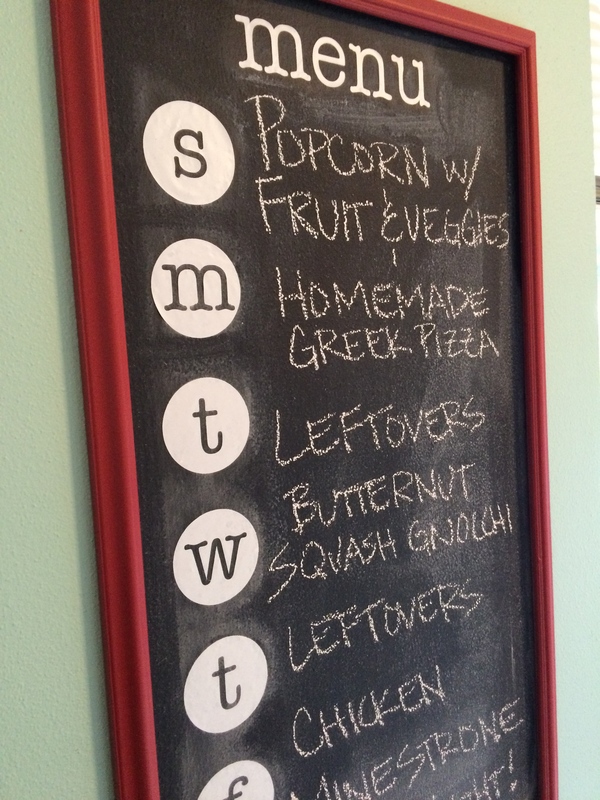 Make it into a habit to plan out the week’s menu and make a grocery list before getting groceries for the week. Do what works best for you and your family. Plan around your busy days and plan for leftovers. If you know you may be rushed one night, make part of the recipe the night before, such as cutting up all the veggies or prepping the sauce. A lot of recipes don’t have to be made completely at one time. Having trouble thinking up meals? Don’t worry, I go through those same weeks. Get inspiration from blogs (ahem, like this one! ), Pinterest, or cookbooks. Still having trouble? 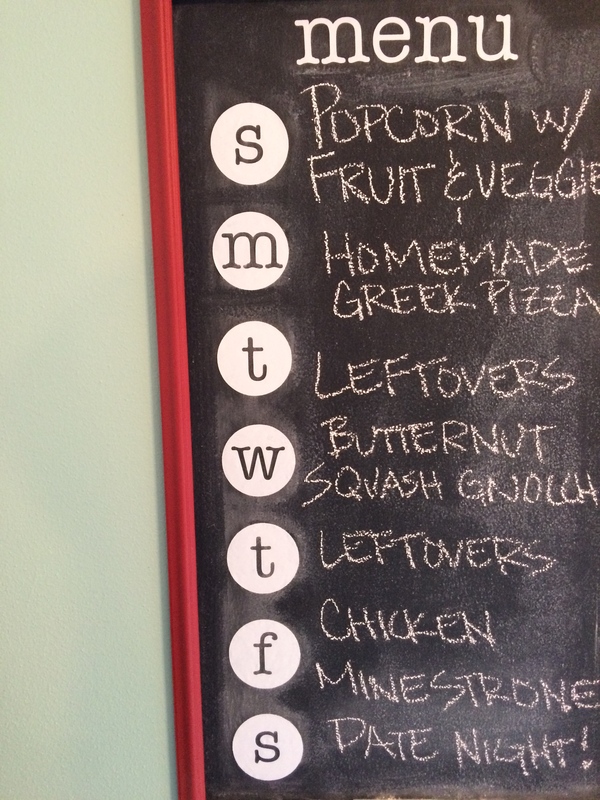 Designate a theme for each day of the week so you have a base to go off of (like Meatless Mondays or Taco Tuesdays). I go in spurts from where I have too many recipes I want to try and not enough time to try them all to where I have no ideas at all as to what to make. I’m sure you’ll find that same thing happening to you, too. 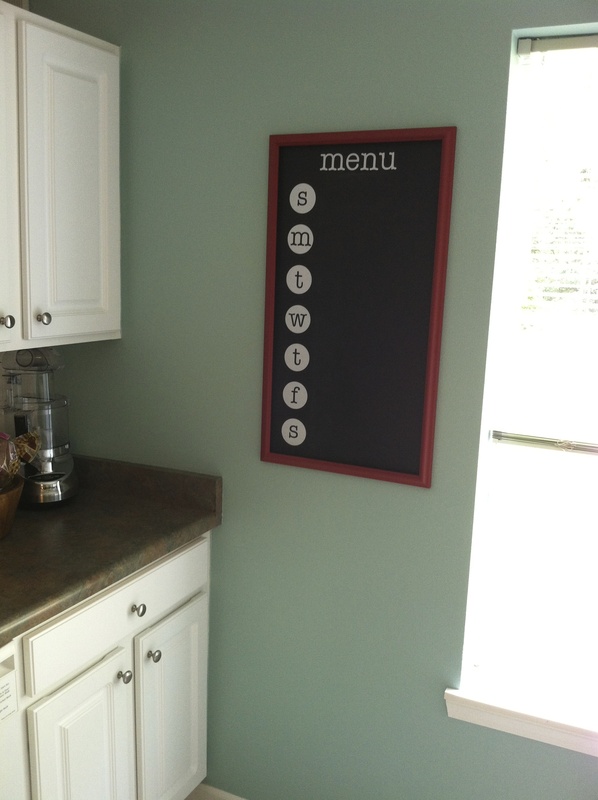 A fun, yet practical, way to display your weekly line up is by a menu board. It makes it easy for the whole family to see and anticipate what’s coming up for the week. 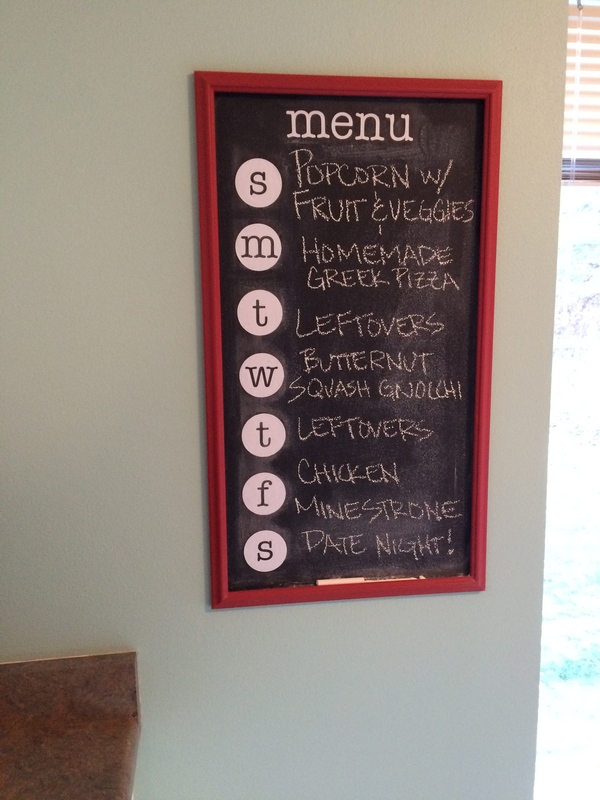 Our menu board works perfectly for us in our kitchen. We received the vinyl lettering from my sister-in-law (check out her blog for in-depth directions on how to make this!) for our wedding and we’ve been using it religiously every week since (that’s about 65+ weeks planned out!). Not to mention, it’s a great conversation piece! 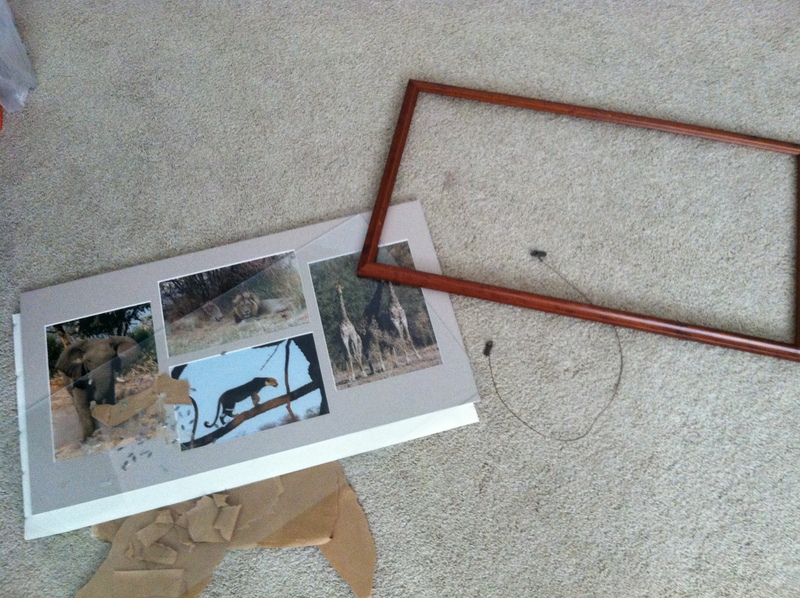 To make it, I just found an old, framed picture at Goodwill, took it apart, painted the frame, and nailed it to part of the wall I had already painted with chalkboard paint. Works like a dream.